The Memphis Grizzlies announced on Aug. 20 that they will hold training camp at the RIMAC Arena on the campus of University of California San Diego from Sept. 30 – Oct. 3. Before departing for San Diego, the Grizzlies will hold their annual Media Day in Memphis on Monday, Sept. 29 from 10 a.m.-1 p.m. at FedExForum. Coaches and select members of the front office will be available starting at 10 a.m., while players will be available starting at 11 a.m. This marks the first time that the Grizzlies have held training camp in San Diego. Since relocating from Vancouver in 2001, the organization has held camp in Memphis nine times and also has traveled to Nashville, Tenn. (2013), Birmingham, Ala. (2009) as well as Malaga, Spain (2007) and Barcelona, Spain (2003) as part of the NBA Europe Live Tour. 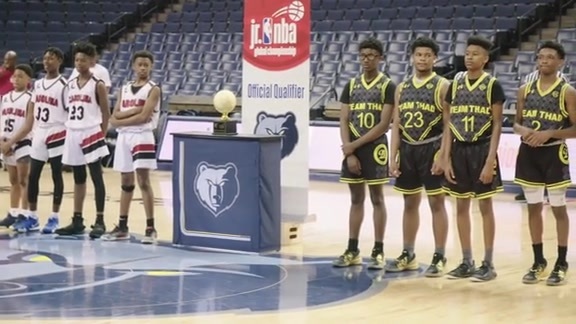 Upon the team’s return to Memphis, the Grizzlies will treat fans to a free, lunch-hour Open Practice at 12:30 p.m. on Monday, Oct. 6 on the main floor at FedExForum. All of Grizz Nation, including students and families, are encouraged to attend, as this date coincides with Fall Break for Shelby County Schools. There will be a plaza party tipping off at 11 am on the plaza outside FedExForum, which will include face painters, balloon artists, a live DJ, Grizz and the Grizz Girls before the doors open at Noon. Food and beverage will be available for purchase. Fans are asked to check grizzlies.com for training camp updates and coverage. Coming off a franchise-record fourth consecutive playoff appearance, the Memphis Grizzlies will tip-off the 2014-15 regular season, their 14th season in Memphis (20th overall), against the Minnesota Timberwolves at 7 p.m. on Wednesday, Oct. 29 at FedExForum. Prior to that, the Grizzlies eight-game preseason slate tips off on Wednesday, Oct. 8 at 7 p.m. against the Milwaukee Bucks at the Resch Center in Green Bay, Wisc. The Grizzlies will host four preseason games at home against the Atlanta Hawks (Saturday, Oct. 11), Flamengo of Brazil (Friday, Oct. 17), Cleveland Cavaliers (Wednesday, Oct. 22) and Miami Heat (Friday, Oct. 24). Single game tickets for all regular season and preseason contests will go on sale Saturday, Sept. 27 at 10 a.m. Tickets for all games start at just $10, and will be available for purchase by calling 1-800-4NBA-TIX, at all Ticketmaster locations, Ticketmaster.com, the FedExForum Box Office or online at grizzlies.com. Fans who want to support the Memphis Grizzlies by purchasing 2014-15 Season Tickets can do so by calling (901) 888-HOOP or going online to grizzlies.com. For more information on the Grizzlies, ‘like’ Memphis Grizzlies on Facebook or follow on Twitter (@memgrizz). All practices (Sept. 30 - Oct. 3) will be at the RIMAC Arena on the campus of University of California San Diego. Training camp practices are closed to the public. Players and coaches will be available to the media immediately following the first practice only on Sept. 30 - Oct. 3. The Open Practice at 12:30 p.m. on Monday, October 6 will be open to the public.